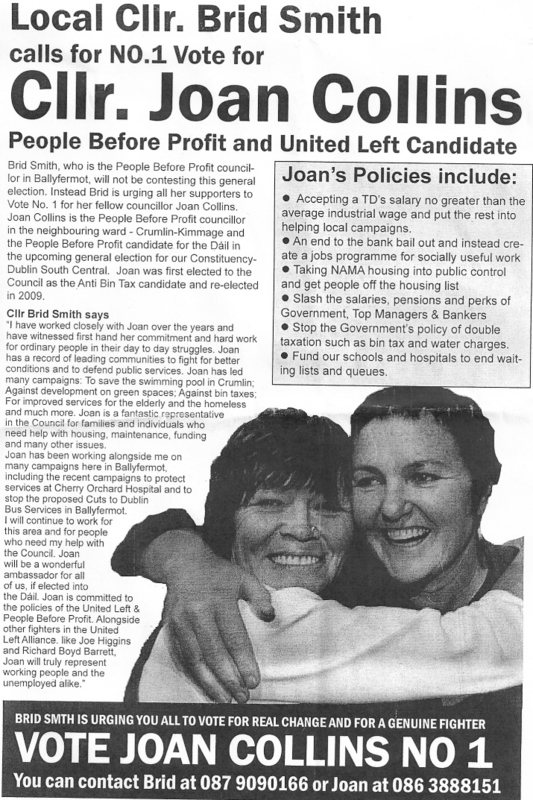 From the 2011 General Election campaign a letter to voters from Councillor Brid Smith urging a vote for fellow People Before Profit councillor Joan Collins who is running in Dublin South Central. One wonders if the support of Brid Smith will turn out to be a blessing or a curse! See what I mean , the Lunacy of the Smith Moonbeam. However, I wish Joan Collins well , she has always had enough sense to avoid the SWP – Smith tried to run against Joan in 2007 but then she withdrew as Joan prepared to mop her up . Thus all this new-found Comradeship is indeed touching. These are the leaflets of a mob orator, a class warrior. a demagogue like Hitler or Stalin. To vote for the likes of Boyd Barrett would be jumping from the frying pan into the fire, he is a poison in Irish politics, a canker to be cut out. His Socialist Workers Party are the real Nazis of our age: The Nazis has the same Party title, the National Socialist Workers Party!!! Boyd Barrett takes over where they left off , there is no overt racism but all the rest of the nihilistic destructive policies are there. They have the most negative economic and financial policies in the Western hemisphere , they stand against everyting and for nothing as they now attempt to use the crisis to get themselves elected and carve a Soviet State out of Ireland. Avoid Boyd Barrett and his Partei Apparatus like the plague! I do know that back in the Eighties Boyd Barrett actually applied to join the Irish Nazi Party , his application was rejected! All I am saying , never mind about the circus clown Norris, is that Boyd Barrett and the SWP are a neo-Nazi Party. Now you are on an obbessive LONE crucade against Richard Boyd Barrett. YOU MICHAEL MCGRATH HAVE BEEN EXPOSED AS A NAZI ON PUBLIC RECORD IN THE SEANAD. As a woThese are the leaflets of a mob orator, a class warrior. a demagogue like Hitler or Stalin. tking journalist I came across the proof that Boyd Barrett applied to join the Irish Nazi Party at the time , and that his application was rejected . – and as a working journalist/photographer I came across the proof that Boyd Barret applied to join the Irish Nazi Party and that his application was rejected. Of course he is entitled to sue for libel , let’s see how far that gets him! You’ll have to do better than taht Michael- produce the prooff or shut up. Secondly, David Norris doesn’t write the public record of the Seanad debate. You wrote and distributed a leaflet filled with anti gay, anti immigrant rant on it and put your name and details on it. Proof above. Awaiting your proof of your ridiculous accusation about RBB. If not its libel. He he he , “Sean” you’re getting hysterical now, contorted face like Boyd Barrett , watch you don’t get an epileptic fit like Boyd Barrett too! I was doing the investigation as a working jpurnalist/photographer for the Evening Press at the time , that’s how I came actually handed his letter of application by a Dublin Nazi at the time for a twenty quid note – the nazi concerned had a raging thirst on him so parted with those papers that I forwarded to the Evening Press with my copy. The only hysterical person here is you. Produce the proof or cease. You’re getting really hot ounder the collar of your designer shirt now , aren’t you ” Sean” ! The voters of Dun Laoghaire have a right to know that Boyd Barrett is in fact a Neo-Nazi . As regards your continuous referral to Norris’ drivel in the Senate it means nothoing . Now I see you are saying that a Senator cannot read material into the record of the Senate . Ha! Silence! Did you MICHAEL MCGRATH deny you sent the below mentioned leaflet to David Norris which is on public record? Ha! Exposed michael- you haven’t disproved the renowned senator norris’s proof your a Nazi and you’ve offered proof of your lie that Rbb is one. You still haven’t proved what we all know is a fantasy of yours. Libel is a dangerous thing. the Senate, you arte barking up the wrong tree there ” Neil” . But It is my duty as a journalist (photo-journalist) to expose fakes and liars and posers like Richard Boyd Barrett to the voters of Duun Laoghaire in particular , but also to the people of Ireland as this cretin proposes to get himself elected as a Deputy in our national parliament on Friday , which would affect all of us in this country for the worst , that is why I expose Boyd Barrett here for what he is, no other reason , I am not involved in politics, in fact I abhor politics, I am simply a working journalist., and I have absolutely nothing to gain by so exposing this rogue Boyd Barrett , except to let the good people of Dun LLaoghaire know exactly the type of Con Man he really is. Michael/Neil/Sean-While I am fascinated by this arguement you seem to be having may I ask exactly what it has to do with the issue of the very strange letter of support for Joan Collins sent out by Brid Smith? I’ve never had any time for Smith and her anger tactics and the fact that she’s backing Collins doesn’t actually fill me with a lot of confidence about Collins either. However, what really stands out to me is that one of Collin’s policies is ‘to fund our schools and hospitals so end waiting lists and queues’, yet no where in any of her literature does she say how she’s going to do this. On a slightly related note another candidate in Dublin South Central, Paul King running as an Independent, sent out election literature which contained a story about walking his dog and not a lot else. All the details of PBP policies on economy, etc available to read on http://www.peoplebeforeprofit.ie/policies where we set out how this can be achieved. As for Mr McGrath- he’s an irrelevent lunatic- his ‘assertions’ are laughable for anyone who actually knows Richard and have no basis in reality- Mr McGrath can’t even offer any evidence to back up his libelous assertion. We do know however that Mr McGrath is a nazi and has engaged in homophobic and race hate propaganda. I wish Joan, Richard and all well in the election. On 5 January 1919, Drexler created a new political party based on the political principles which he endorsed by combining his Committee of Independent Workmen with a similar group, The Political Worker’s Circle, led by newspaper reporter Karl Harrer. Drexler proposed that the party be named the German Socialist Worker’s Party, but Harrer objected to using the term “socialist” in the name; the issue was settled by removing the term from the name, and it was agreed that the party be named the German Workers’ Party (Deutsche Arbeiterpartei, DAP). To ease concerns among potential middle-class nationalist supporters, Drexler made clear that unlike Marxists, the party supported middle-class citizens, and that the party’s socialist policy was meant to give social welfare to German citizens deemed part of the Aryan race. They were (as I assumed everyone knew) on the far right of the political spectrum whereas the Irish Socialist Workers party (which seems to have changed their name to the United Left Alliance for ironically similar reasons) are on the far left. Polar opposites one might say. Fine Gael would probably be the closest Irish political party in ideology to the Nazis, but I’d hardly call them facists. Dev ended that possibility when he banned the Blueshirts in 1933. But in a free society like Ireland, facists like Mr. McGrath will always exist. Euronews and France 24 are predicting a large swing to the left on Friday. Hope you can deal with that. Unfortunately, no DDI (www.directdemocracyireland.org) candidates are running in Dun Laoghaire, so after deep contemplation RBB will probably get my #1. Fis Nua may also get my 3 or 4 for their ‘rational drug policy’ but it’s a tough constituency. Sorry to disappoint you mr mcgrath- you forgot that when you wrote your anti gay racist, Nazi hate leaflet you put both your name and address on it- not very clever are you now! Hard to deny it now. As for the national media- I’ve done the same- got there before you! Unfortunately, they don’t seem interested- you being a Nazi not a huge deal as a lone Nazi your not much of a threat to civil and decent society- thankfully. Bye! Much of this brings us back to the old socialist/communist argument—-should there be free speech for nazis? Free speech for those who would subvert free speech and democracy when it suits them? Or should they just be kicked off the streets like at Cable Street! The question remains and as this economic crisis deepens may become even more relevant!